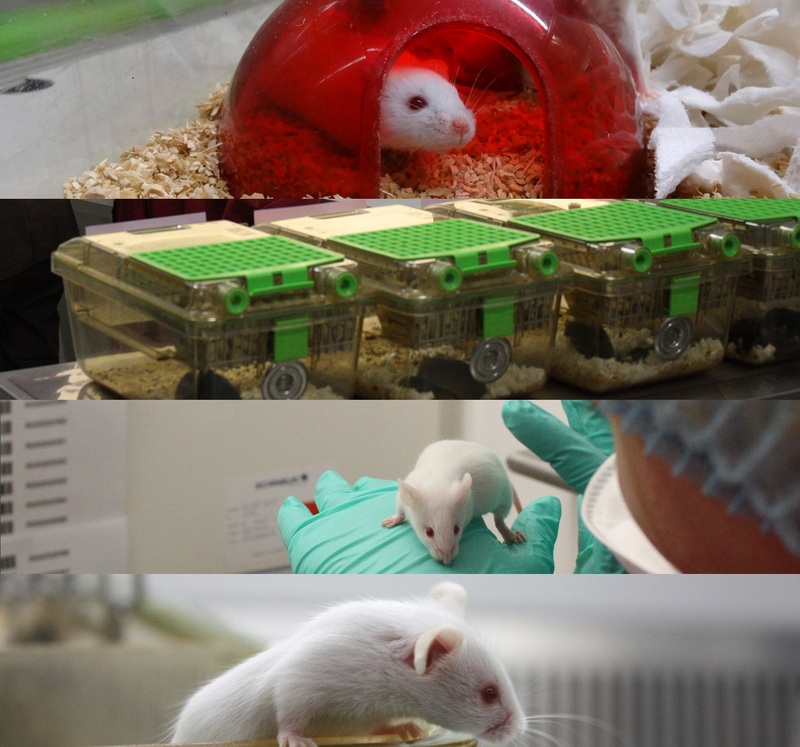 Exactly three years ago, Speaking of Research published a page listing around 100 animal research statements of research institutions, universities, medical research charities, pharmaceuticals, scientific societies and more. After a year of building up this list, we introduced a rating system that let organizations know how good their statement was. We gave them marks according to how informative the core statement was, whether there was further, extensive information, whether they included case studies, and whether there were images or videos on the website. Ten institutions managed top marks in November 2015. Now, two years on, we have 350 statements of which 29 have scored full marks. Not only have the number of statements increased over the years, but also the number of organizations which track them. This includes Americans for Medical Progress, Foundation for Biomedical Research, and the Concordat on Openness website (to sign the Concordat, organizations must first have a clear statement on their website). What makes the Speaking of Research list special is both its breadth (we are the only one covering multiple countries) and its rating system. As a result, if you search on the website for “animal research” or “animal testing” the webpage comes up. Similarly googling the organization name and “animal research/testing” brings up the website in the first link. The opening statement is short but gives a clear indication of why animals are used. This statement also ensures the website appears on our statement list. Babraham Institute scientists study fundamental processes in our cells: how they develop, survive, function, age and die. This basic biology underpins future medical advances, just as past research led to the treatments we receive today. The benefits will be felt in our children’s and grandchildren’s generations but without today’s basic science there will be no foundation for tomorrow’s medical research. Mammals differ widely in size and shape but their cells and genes are broadly similar. Because of this, information from studies of mice or rats can be relevant to other mammals including humans, pets and farm animals. Between this and the policy page, there is enough of a clear explanation of why the organization conducts animal research to grant it the first ✓ mark for “More information”. There are many ways to get the second ✓ mark for “Extensive information”. 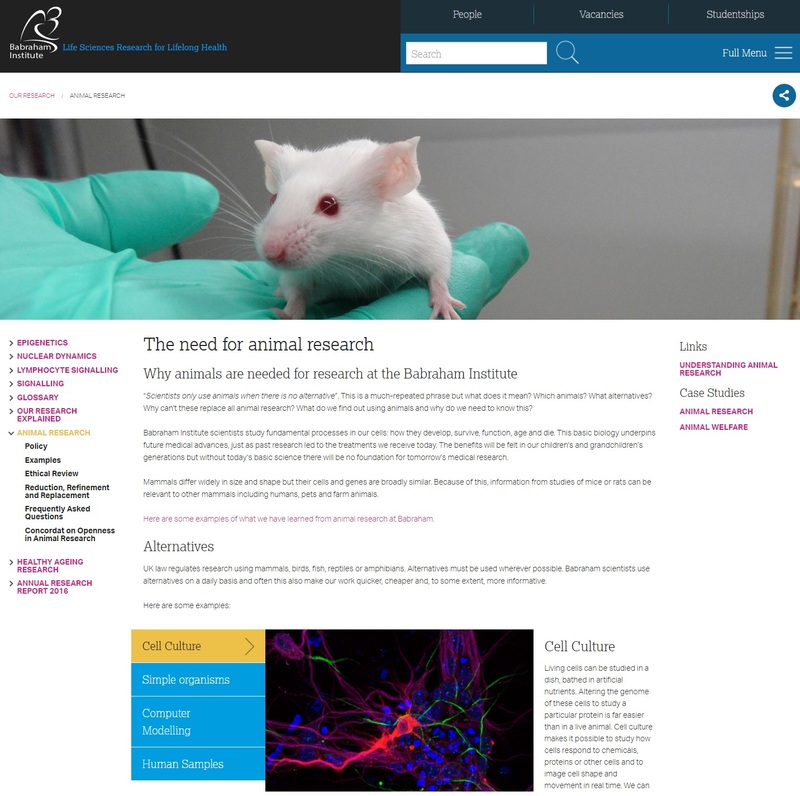 Babraham manage it by providing additional information on their ethical review policies, implementation of the 3Rs (each R has its own detailed page including case studies), and a FAQs section which provides information not just on the use, but also the limits, of animal research. The Examples page provides six case studies of how animal studies have helped research at the Babraham Institute. Further case studies of the 3Rs can also be found in the relevant section. This grants the website the “Case Studies” ✓ mark. Finally, the website shows high-resolution images of animals in the facility. This allows them to get a ✓ mark for “Images / Videos”, though in the future we would love to see some videos showing how and why animals are used. So there we have it – a handful of ideas for improving your website. To provide a summary. Put the statement on an easy-to-find page on the website, preferably with the phrase “animal-research” in the URL. Try to avoid putting the statement in a PDF file. Make sure the statement can be found when people search your website or a search engine for it. Remember, some people will search “animal experiments” or “animal testing”, as well as “animal research”. For more information about the role of animals in research, we recommend checking out the Speaking of Research website. Make sure your website appears on our list. If not, contact us on the form below. We are also happy to provide free advice and recommendations for how to improve your animal research pages. So please feel free to contact us on the form below. It helps our overall goal of providing accurate information about the role of animals in medical, veterinary and scientific research. Previous Previous post: 2017 SFN Attendees: Does your research depend on animal models? Next Next post: Research Roundup: Studying deadly cancers in dogs, low calorie diet and type 2 diabetes and more!